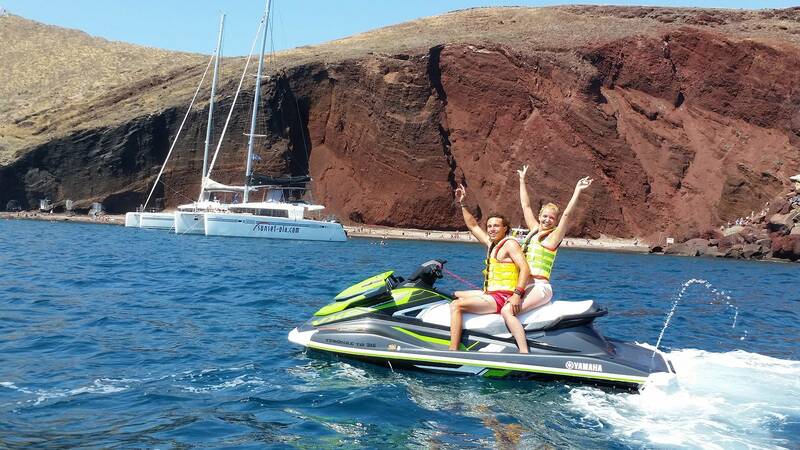 Visit all the famous sites of Santorini by sea on this Jet Ski Safari! 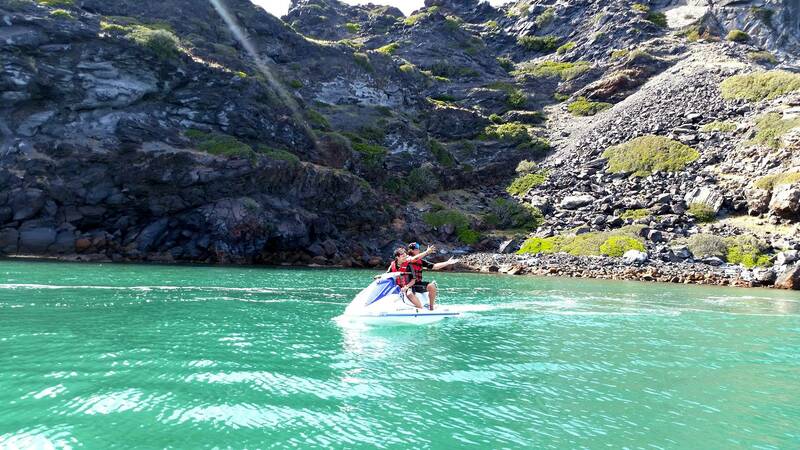 If you’re an adrenaline junkie, love adventure, water sports and looking for an alternative way to experience this mesmerising island, then this Jet Ski Safari is just the activity for you! Are you up for the challenge? 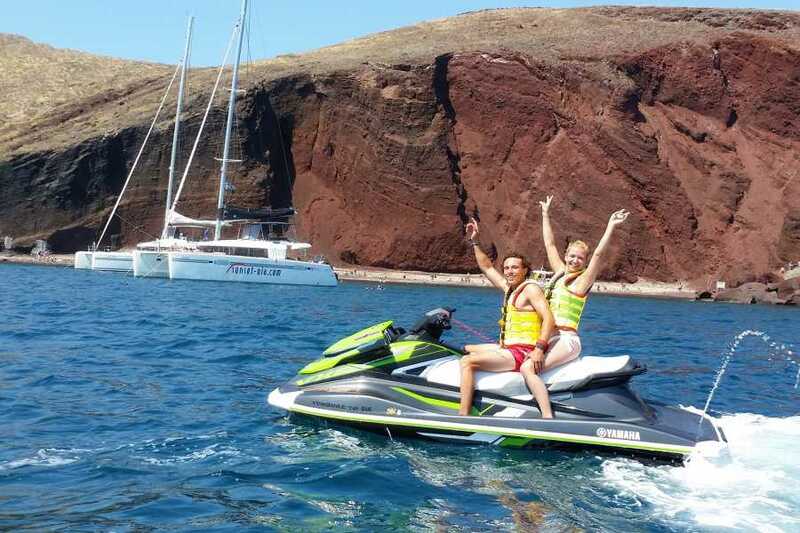 Whether you’ve never been to Santorini or are a returning visitor, don’t miss out on this amazing opportunity to see Santorini by sea on a Jet Ski Safari! 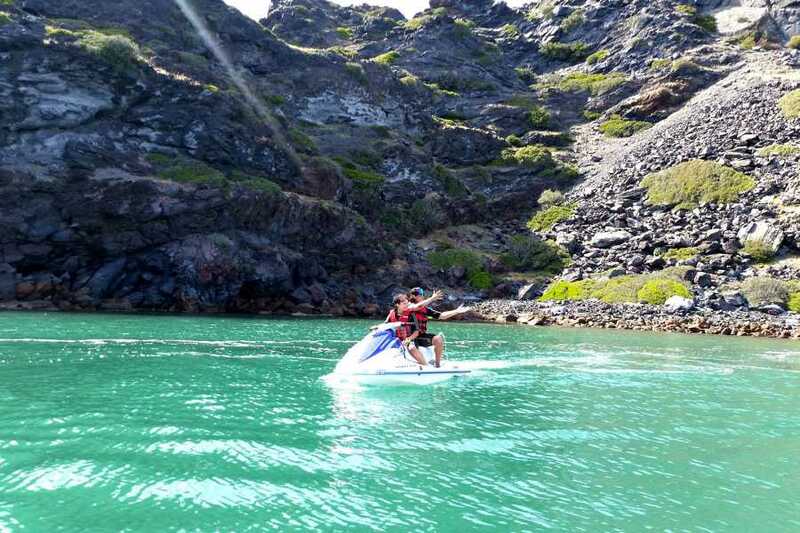 Ride with us along the deep blue Aegean waters and feel the adrenaline rush in this unique trip! Oh, and don’t forget to bring your camera, because the views will be nothing like you’ve seen before! The adventure starts at Perivolos Beach, at the southeast coast of Santorini, famous for the crystal-clear waters and black volcanic sand which is bound to impress you. This is where you will meet your instructor and guide for the day. The first destination on your Jet Ski Safari itinerary is Vlychada, famous for its enchanting landscape combining towering cliffs and black volcanic sand. You will then ride towards the Red Beach, an extremely popular astounding sight of red sand and rough surroundings. If you prefer untouched nature the serene, inviting White Beach is where you should stop for a swim next! Accessible only by sea or on foot, surrounded by white cliffs, this is one of the quieter beaches with almost no facilities, except a cave canteen where you can get refreshments! Next you will encounter Mesa Pigadia, a small cove defined by towering cliffs that’s both quiet and stunning. The enigmatic colourful doors in the cliff -built by fishermen who store their boats there, only add to the ambience. Once you’ve absorbed the view, you’ll continue to the Black Mountain, an imposing site not to miss! If you’ve opted for Jet Ski Safari Route 1, it’s time to head back to Perivolos Beach. If, however you are up for a longer trip, Route 2 will take you to the Hot Springs near the Volcano for a swim in the sulphuric water before riding to Aspronisi, a small island formed by volcanic eruption 2000 years BC, before going back. This is the end of Route 2, but the fun goes on for those who are looking for more adrenaline! Join us on Route 3 and ride to Thirasia, Santorini’s sister island for those picture-perfect views, continue along the Caldera and finally stop at Oia for one of the most iconic views of the island! Your Jet Ski Safari begins at Perivolos Beach. Meet your instructor for the day and get ready to go! Route 1 (South Coast): Perivolos – Vlyhada – Red Beach – White Beach – Mesa Pigadia – Black Mountain. This should take about 60-90 minutes. Route 2 (Volcano/ Hot Springs): Perivolos – Vlyhada – Red Beach – White Beach – Mesa Pigadia – Black Mountain – Volcano Hot Springs – Aspronisi. Allow 120-140 minutes for this trip. Route 3 (Around the Island): Perivolos – Vlyhada – Red Beach – White beach – Mesa Pigadia – Black Mountain – Volcano Hot Springs – Thirasia – Caldera –Oia – Aspronisi. Route 3 comprises 200-260 minutes of pure adrenaline and fun! If you opt for Route 2 or 3, snorkelling equipment will be provided, so you can enjoy the mesmerising Santorini sea to the fullest!